Great for Elk and Venison! Okay so it isn’t exactly “quick” but compared to traditional corning, which takes weeks in the refrigerator, this is an excellent method for achieving similar taste and a roast that simply falls apart. 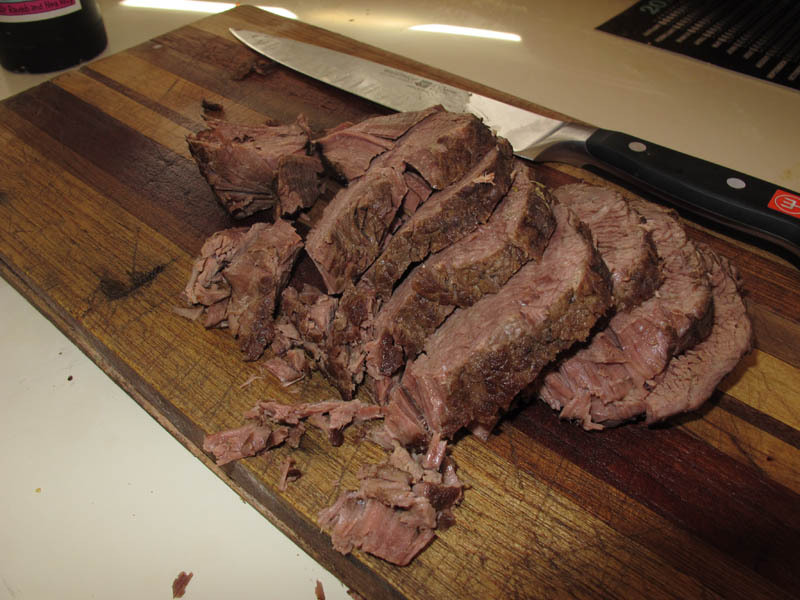 Make the perfect elk or venison reubens! This is a recipe that requires overnight cooking, so plan ahead. At some point before you turn in for the night, preheat your over to 220 degrees Fahrenheit. Next, take a cast iron dutch oven and put it on a burner turned to medium-high heat. Place clarified butter or vegetable oil in the bottom of dutch oven (about 2 tablespoons). Once the oil has gotten to temp. brown the roast. When browning make sure you give each side sufficient time to truly brown (you want to create a caramelized and crispy surface; it enhances flavor) at least 2 minutes. Once the roast is done browning, turn off the surface burner and quickly add a cup or two of cold water. Slice the onion into four or five large rings and place in dutch oven. Fill dutch oven with water until the roast is covered by about half an inch. Add approximately one ounce of pickling spices per quart of liquid in pan. If you wish, add more salt and pepper, starting at one tablespoon salt and one teaspoon pepper per quart of water, and increasing as desired. Now place the dutch oven back on the burner and turn heat to medium high. Remove from heat the moment a slow boil is achieved. Place in oven and allow to cook overnight at 220 degrees. In the morning, the roast will be very soft. If you wish to pull the meat, do so after letting the roast rest on a carving board for five or ten minutes. For a more traditional corned beef cut, place the roast in the fridge for a few hours. This will stiffen the roast and allow you to slice layers of meat off. If you are trying to cook venison or elk for someone new to eating game, this is an excellent recipe to start with. Don’t be afraid to apply some of these methods to other meats. Goose does very well cooked in a mira pioux at similar cooking times and temperatures.